6) The Spirit of Aloha Show! 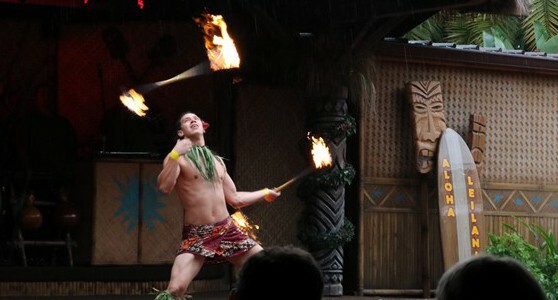 Located the Luau Cove at Disney’s Polynesian Resort, The Spirit of Aloha Show brings you hula dancing, fire dancing, and a wonderful dinner that is all you care to eat – family style. This means you don’t even have to walk to a buffet, because your server brings you more food when you ask for it. Beverages will include bottomless beer, wine, tropical rum punch, sodas, coffee and tea. Other alcoholic beverages may be purchased from the full bar. Dress is casual and shorts are permitted at this show. Reservations are paid in full at the time of booking by contacting 407-WDW-DINE.